Compare to Clactonian stone-tool assemblages. Name given to the stone tools of the Lower Paleolithic period in Europe, made by Homo erectus. 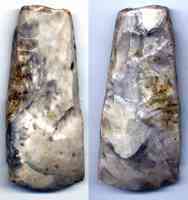 Scrapers and knives are made from flakes chipped off of cores from alternating directions; the cores themselves were often used as choppers. Compare to Acheulian stone-tool assemblages. Occurs at the end of the European Middle Paleolithic. further divided into Quina and Ferrassie based on types of scrapers.